* Switch the car’s ignition to its accessory position. * If the car is a 2005 model or newer, turn on the hazard lights (emergency flashers). This will help keep the car’s CAN bus awake during diagnostics. * Connect your Durametric cable(s) to the car. * If you are using only the Durametric USB-to-OBDII cable, connect this cable to the OBDII diagnostic port in your car. * If you are working on a pre-1996 model year car, connect the round adapter cable to the round diagnostic port in the car and connect the Durametric USB-to-OBDII cable to the round adapter cable. * If you purchased the 50’ extension cable, connect it directly to the car (or to the round adapter cable) and connect the USB-to-OBDII cable to the extension cable. * If you are working on a Porsche factory racecar and have the Durametric cup adapter cable, connect it between the USB-to-OBDII cable and car or between the 50’ extension cable and the car. * Connect the Durametric cable to the USB port on your computer. * Confirm a steady green LED at the OBD-end of the Durametric cable, that your computer recognizes the attached Durametric cable, and – with the first connection – the computer indicates the hardware is installed successfully. 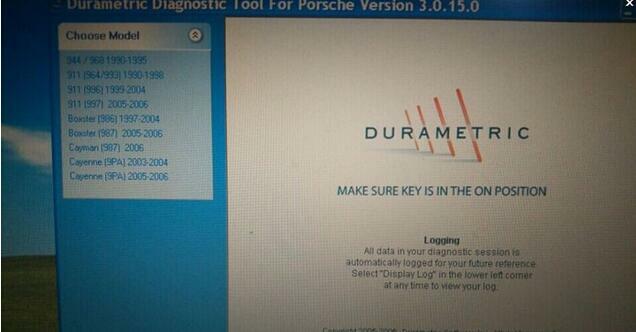 Durametric is equipped with many of the same capabilities and features of the Porsche factory tools.The following sections guide you through the many features of the program to help you get the most from your tool. * Click the Windows Start button. Fault codes, shadow fault codes, their descriptions, and fault status information are included in the display when supported by the control unit. The codes displayed are the same codes used by the factory tool and can be directly referenced in the factory service manual or other reputable repair manuals. Freeze frame details are included with supported engine control units. Freeze frame information includes various operating and environmental data taken at the time the fault appeared. You can use this information to aid in troubleshooting and to help resolve improper operation. Control units store some faults for information-only purposes. In these cases, there is no repair action necessary. Durametric indicates the difference between actionable faults and information-only faults using two icons. The yellow circle icon with the exclamation point in the center indicates an information- only fault. The red circle icon with the exclamation in the center indicates an actionable fault. Refer to your car’s service repair manual for more information on information-only faults. To clear fault codes or shadow fault codes from the control unit’s memory, click on the Erase Fault Codes or Erase Shadow Fault Codes option, respectively, for the control unit selected. Alternatively, you can select to erase fault codes in all control units at once by selecting the Functions menu option and selecting Clear faults in all units. If you want something that will read and reset fault codes, and read live data, from all the control modules of everything from a 9×6 up to a 9×1, including Panameras and Cayennes, take a look at the iCarsoft i960 hand held scanner. About ￡100. It won’t reset service indicators, but is a useful tool for diagnostics, and resetting things like airbag lights. (No affiliation, by the way). Used this. direct off Obd2tool.com not resold and marked up.